UTRECHT, Netherlands — Dutch prosecutors said Tuesday they are taking very seriously the possibility that the deadly shooting on a tram in the central city of Utrecht was an act of terror. The nature of the Monday’s attack and a note found in a suspected getaway car suggest a possible terror motive, prosecutors said in a statement, but they add that other possible motives also are being investigated. They did not elaborate on what was written in the note found in the car. The statement also said that investigations so far have not established any relationship at all between the main suspect, Gokmen Tanis, and the shooting victims. Prosecutors confirmed that three people died: a 19-year-old woman from the neighboring town of Vianen, and two men aged 28 and 49 from Utrecht. Three others were seriously wounded and four more suffered light injuries, according to prosecutors. Tanis, a 37-year-old man of Turkish descent, was being held on suspicion of “manslaughter with terrorist intent,” though authorities have not ruled out other possible motives. He was arrested Monday evening after an hours-long manhunt that nearly paralyzed the Netherlands’ fourth-largest city and sent shockwaves through this nation. Officials said Tanis has had a long criminal record in the Netherlands involving a variety of offenses — none terror-related — but gave no details. Police spokesman Martin de Wit said that a total of three people — the alleged shooter and two others whose involvement was being investigated — were in custody following Monday’s attack. Prosecutors said that police recovered a weapon during the arrest. The tram shootings came just days after 50 people were killed when an immigrant-hating Australian white supremacist opened fire at two mosques in Christchurch, New Zealand, during Friday prayers. There was no indication of any link between the two events. Prosecutors were questioning all three suspects and it was not yet clear if Tanis would be brought before an investigating judge on Tuesday. 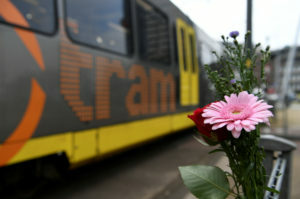 Members of the public and Utrecht’s mayor on Tuesday placed bunches of flowers near the busy traffic intersection where the gunfire erupted Monday on a tram. While the investigation appeared to be increasingly focused on a terrorist motive, authorities have not ruled out other possibilities. Dutch and Turkish media citing his neighbors in Utrecht have speculated that the shooting may have been linked to a relationship, but that appears increasingly unlikely after prosecutors said none of the victims were known to the main suspect. Corder reported from The Hague. Peter Dejong contributed to this report.